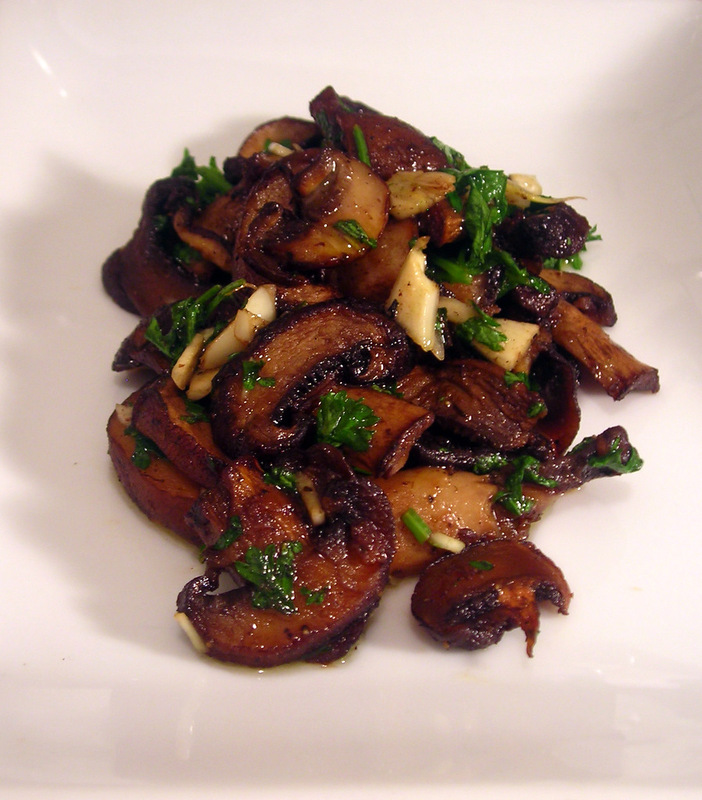 Roasted mushrooms are a regular menu item during the winter. They have a deep earthiness that often reminds me of a forest floor strewn with pine needles. This is a delicious appetizer or side dish, or can be paired with other dishes. For example, I sometimes feature roasted chanterelle mushrooms as a topping for ricotta gnocchi. This recipe works with cremini mushrooms (which in reality are baby portobello mushrooms), but can be adapted for other varieties. Pre-heat oven to 400 F. Place mushrooms in a Pyrex baking dish or roasting pan. Season with salt and pepper, then drizzle lightly with olive oil. Mix well. Roast for about 20 to 25 minutes, or until mushrooms are sizzling. Combine garlic and parsley in a small bowl; add lemon juice to taste. When the mushrooms are done, remove from heat and stir in the garlic mixture. Spoon onto individual plates, then serve at once. Time: About 35 minutes, including prep. This is my entry for Weekend Herb Blogging #317, which is hosted by Simona of Briciole and organized by Haalo of Cook (almost) Anything at Least Once. Weekend Herb Blogging is a weekly foodblogging event that was originally begun by Kalyn of Kalyn’s Kitchen. 17 Jan	This entry was published on January 17, 2012 at 2:58 am. It’s filed under food, food photography, vegan, vegetarian, Weekend Herb Blogging, winter and tagged appetizer, mushrooms. Bookmark the permalink. Follow any comments here with the RSS feed for this post. i never say no to mushrooms. I am making ricotta gnocchi soon and will certainly remember your suggestion. I like mushrooms and usually cook them in a pan: I should try the oven the next time. Thank you so much for your contribution to WHB!